Here’s a short but powerful lesson from RealLife TV on how native speakers cut and connect their words in the simple past. This is called connected speech. 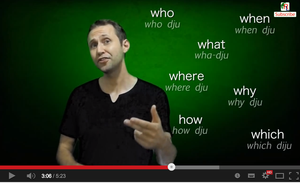 In this lesson, I explain why sentences like “what did you do” become “wha-dju do” in both formal and informal American English. Not only will this lesson improve your listening comprehension, but you can use it to learn the rhythm of flow of native speech and dramatically improve your pronunciation. Aww yeah! Welcome to another episode of Real Life TV. Today I’m excited to teach you about connected speech and how we use this in the simple past with the auxiliary verb DID. So stay tuned and relax, have fun. So, to start, I’m going to ask you a few questions and I want you to listen to my pronunciation and to compare it to what you’ve learned and to what you expect from native speakers. If you’ve noticed, I’m cutting my words. I’m bringing them together, I’m morphing them, I’m linking them, I’m shrinking them. So, this is what we call CONNECTED SPEECH. So, contrary to what you might believe, this is how native speakers really speak. In standard American English, what I’m using right now, other countries do this, other dialects of English have other forms of doing it. But it’s common in all languages and there’re different degrees of it in English, in American English. So, I’m going to teach you the degrees of connected speech using past tense with the auxiliary verb DID. For exemple, what did you do today?, which is speaking very slowly. So, to be honest, I never really say “what did you do today?” That seems very unnatural to me, because you are separating the words, they don’t come together, they don’t flow. Notice how the “wha-di-ju do doday”. The reason for this on the today is because we use the American T Between two Vowels. Check out that video if you want to learn more about that. You don’t need to speak like this, but it’s important to be able to understand. So, I use the question words to teach this. So, you have who, what, when, where, why, how, which. And this applies the same way with you. Ok, now that you’ve had a chance to tune your ears to connected speech and the way that we use it in the past tense with did, I encourage you to pay attention to it in media, when you speak with your friends, with native speakers, when you watch TV, movies, with music, and play around with it. See if you can imitate natives, see if you can really try to emulate the rhythm and flow of the english language because it will really make your English much more flexible and feel a lot more natural. But, thank you for being here today, for watching this video, if you haven’t already, please subscribe to our YouTube channel. If you want to get more videos like this, we’ll be happy to share them with you. Very helpful! And it's so important to sound more natural.Thanks a lot for one more great lesson! Excellent video and explanation!!. Thank you. Thank you! It is very helpful!! I find the course really wonderful! Very useful for English learners. It helps understand easily native speakers when speaking casually. We need kind of this course more, specially for intermediate and Advanced English learners. Hope you are going to take in account these wishes. Thanks a lot for this lesson about liaisons. We are waiting for another tips. I'm glad it was helpful, Tamie! Thank you for reading and saying hi! Thanks for reading and commenting Miriam! I'm glad this was useful Myriam! Hey Luz I'm glad you enjoyed it. You should check out the connected speech podcast lesson (under the podcasts page on the tab). If you liked this lesson you'll love our podcast! Thank you very much it's very useful that's all new for me but now got it.